The Santa Monica Mountains is the southern California Transverse range of mountains along the Pacific Ocean coast and it's a very beautiful view as themountains look out over the coast. 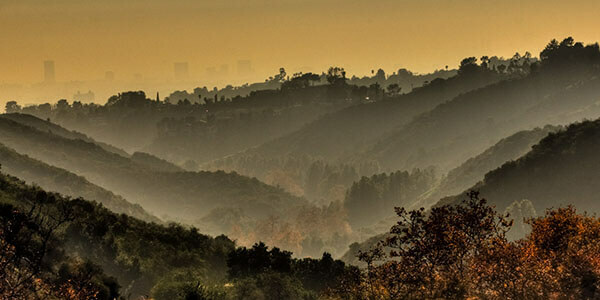 The mountains have many towns and cities that most people don’t even think of as being in the “mountains”, such as Los Angeles, Malibu, and Hollywood. The range is about 40 miles and runs east to west and the southern mountains are a barrier between the San Fernando Valley and the Los Angeles Basin. The northern mountains separate the Conejos Valley from Malibu. On your trip to southern California drive through the range and watch for the wildlife such as mountain lions which are now an endangered species. Snakes also like to make the range home, snakes such as California Kingsnake, Gopher and Garter Snakes and rattle snakes. You will also see the Western Fence Lizard. While in the mountains visit the Santa Monica Mountains National Recreational Area where you can do some mountain biking, camping, hiking, horseback riding or the kids can attended a class and become a Junior Ranger which would be great for show and tell when school is in. You will find many communities along the northern slope of the mountains including Los Angeles, Studio City, and Hollywood. You will find hundreds of things to see and do in these cities to keep you busy for days. Visit a movie studio, go to the Grauman Chinese Theater or see the Kodak Theater to name just a few. You will find many many hotels and motels to spend the night or be adventurous and camp. Restaurants also abound. The Santa Monica Mountains is a wonderful place to visit on your next trip to southern California. Last updated by jack on 06 January, 2014 in Destinations.